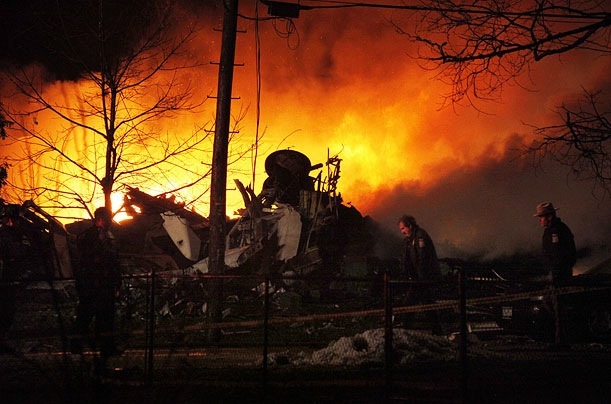 For several days in mid-February, the news was dominated by the airline crash near Buffalo that killed all 50 passengers and crew. Hours of live television coverage of the crash site and days of newspaper articles forced the economic crisis off the front pages. Though it was the first fatal domestic airline crash in 2½ years, it still served to reignite fears in those who view flying as unnatural and dangerous. How safe flying is: But instead of evoking hysteria, it should have served as a reminder of how safe flying is – both absolutely and relative to other forms of transportation. Since 2006, the year of the last U.S. airline crash, almost 30 million flights, averaging over a hundred passengers each, had safely taken off and landed. Compared with vehicular transportation, about which no one seems to have much trepidation, airline flying is extraordinarily safe. Yet no one fears getting into a car. I cannot recall that anyone has written a book entitled “Fear of Driving” (apologies to Erica Jong). How dangerous taxis are: So I’m astonished that we still have acquaintances who are white-knuckle fliers, friends who blithely get into New York City taxicabs with impunity. What’s more, they refuse to buckle up despite the dangers inherent in these vehicles usually driven by angry, less-than-competent drivers who weave at too-high speeds in chaotic traffic. What’s more, the passengers’ jeopardy is exacerbated by the hard plastic “security” panels just a foot away from their noses – a panel that means certain plastic surgery, or worse, in a sudden stop or collision. No matter. It’s a car. It’s safe. 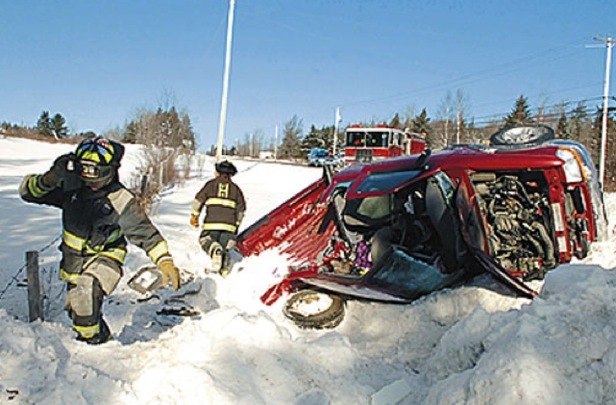 For the ten years ending in 2007, a total of 380,195 American lives were lost in vehicular accidents. By contrast, over the same period, 728 people died in plane crashes, and that includes 524 in the 9/11 terrorist attack. The incredible odds: Here’s the bottom line, as illustrated in the chart below. You’re 40 times as likely to die driving in a car than flying in a plane for the same distance. So the next time you fly, relax. The next time you drive (or are driven), well, buckle up. 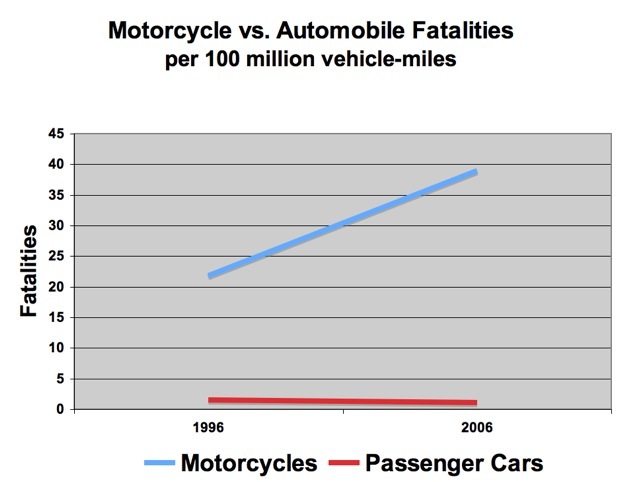 Motorcycles -- incredibly dangerous: Well, if I’ve convinced you that cars are much more dangerous than planes, let me now tell you about an even more perilous way to get from Point A to Point B – drive a motorcycle. While driving has 40 times the fatality rate of flying, riding a motorcycle increases your fatality rate another 40 times over that of a car. And it’s getting worse. In the last 10 years, the motorcycle fatality rate has almost doubled, from extremely unsafe to kamikaze levels. Let’s put it this way: You can take the shuttle flight from New York to Boston with a high degree of confidence of getting there alive. Or, you can hop on your motorcycle and increase your probability of dying along the way by a factor of 1,600. Clearly, it’s more fun to get on your Hog with your chick than it is to suffer the indignities of commercial air travel, but remember, there is a price. Also, consider this motorcycle downer: About 80 percent of reported motorcycle crashes result in injury or death; a comparable figure for automobiles is 20 percent. The drama of multiple simultaneous death: Well, we all know that group tragedies are bigger news than an equivalent number of fatalities spread geographically. For a variety of reasons, a group of people killed at one place and one time is a big event. The same number killed separately, even at the same time, is a non-event. The media, and indeed we who watch and read the media, are more impressed by dramatic calamities. Planes dropping out of the sky! Fiery crashes! Unexplained causes! That’s the stuff of drama. It gets everyone’s attention – TV, newspapers, us. That photo made neither the 11 o’clock news nor the newspaper’s front page. Too common. Too everyday. And suppose a similar mosaic were published the next day. And the next. And the next. Would that make people more afraid of driving a car? I doubt it. Would it instead make them less afraid of flying? Nah. As we’ve learned painfully from this economic crisis, risk is rarely given the respect it deserves in making what should be rational decisions and inferences. 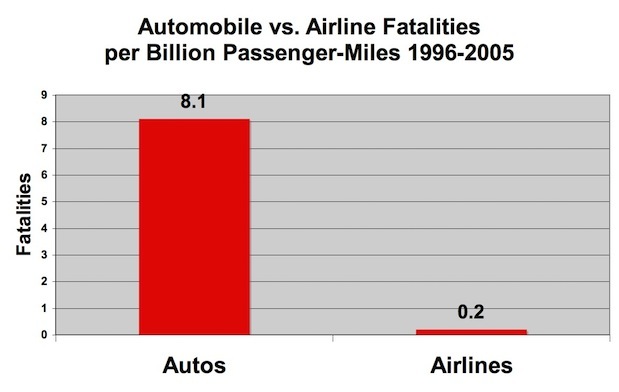 Cars are riskier, much riskier, than flying commercially, but we drive as if we’re immortal. We drive after having had alcohol. 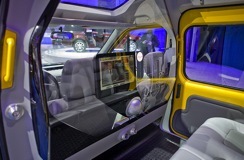 We drive unbelted. We drive when sleepy. We drive while texting (well, some do). Those aren’t rational actions. For these and other reasons, tens of thousands die every year in cars, but it doesn’t seem to bother us one bit. It’s a certifiable epidemic, but there’s no outrage. We accept it as an acceptable tradeoff for the benefits of the car. Planes are safer, much safer, but some of us board a plane with the feeling that this is our last day on Earth. And on those rare occurrences when a fatal plane crash occurs, it immediately is blown way out of statistical significance, resulting in a reinforcement of the fear of flying. Instead, it should remind us of not how dangerous flying is, but how safe.